An apparent rodent infestation at a Burger King in Wilmington, Delaware, has prompted health officials to temporarily shut down the location. 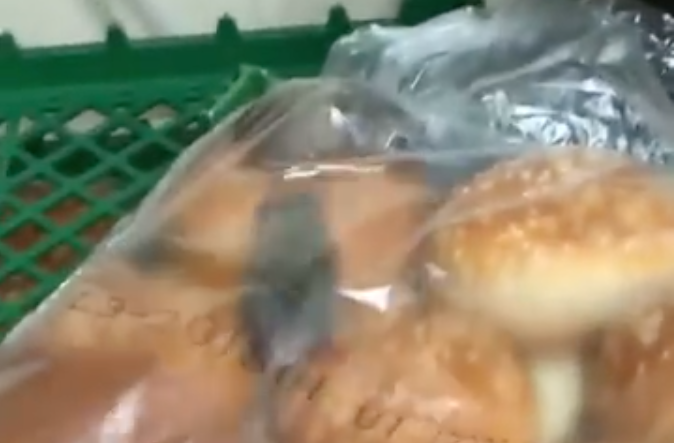 A woman named Shantel Johnson shared a disturbing video on her Facebook page on May 31, which showed rats running through a bag of hamburger buns in the kitchen. "Don't go to Burger King on [Route] 202," she wrote, adding emojis of rats and a skull-and-crossbones to emphasize her point. Delaware Health and Social Services officials say they launched an investigation after the video surfaced, CBS Philadelphia reports. Officials say they responded the next day to the location at 2802 Concord Pike in Wilmington and after conducting an investigation, they issued a Cease and Desist letter due to "gross unsanitary conditions." In the department's inspection report, inspectors observed mouse droppings on and inside hamburger rolls and chicken sandwich rolls, according to the station. "Pallets that rolls were on had mouse droppings. Mouse droppings were observed on the floor near the ice machine, water heater, under storage, near syrup soda boxes and behind fryers," a portion of the report read. Officials called the incident an "imminent health hazard." Burger King said in a statement provided to CBS Philly: "While this is an isolated incident, we take these matters very seriously. Food safety and hygiene is always a top priority for us. We have already contacted the Franchisee, who independently owns and operates the location, to investigate this matter and ensure they take the appropriate measures. We can confirm that the Restaurant is temporarily closed and will reopen once this issue is addressed." Delaware Health and Social Services temporarily shut down that Burger King location and said it will reopen once health inspection standards are met.